Combine the lime juice, orange juice, olive oil, jalapeños, celery, 1/4 cup of the red onion, 1/4 cup of the cilantro, and the salt in a blender and puree until completely smooth. Place the fish in a bowl, add the pureed mixture, and toss well. Cover and let marinate for 20 to 25 minutes outside the refrigerator before serving, stirring from time to time. If marinating for more than 25 minutes, cover and refrigerate. 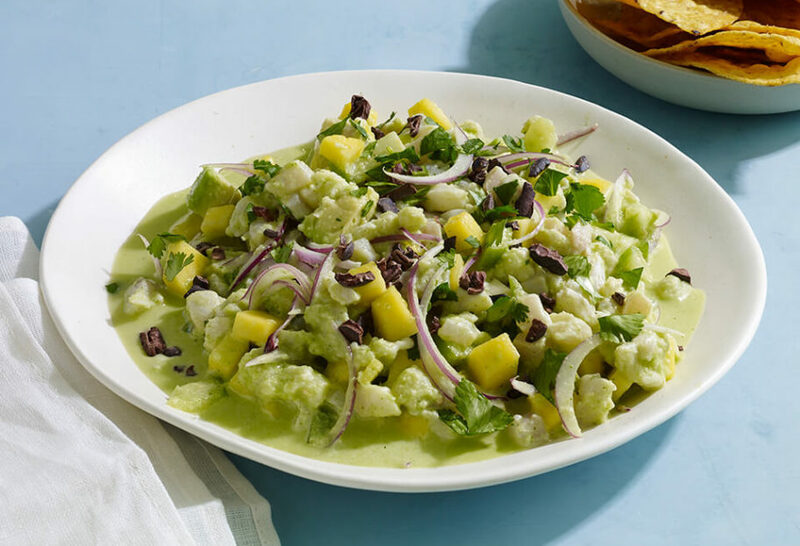 When ready to serve, add the rest of the onion and cilantro, the mango, avocado, tomatillo, and cacao nibs if using. Toss well, taste for salt and add more as needed. Serve with tortilla chips (totopos) or tostadas. My wife and i will be making this tonight for the………… I’m guessing the 15th time. ha. We love it and have made it for guests multiple times! I’m so happy to hear that this is a regular at your house, Chris and Melissa. Gracias, muchas gracias, le deseo eterna felicidad en su vida. Hola Pati, eres maravillosa con tus recetas. Disculpa por molestarte solo quiero perdirte el link de tu video “To Die For Ceviche” ? Me gustaria hacer tu platillo. Estoy tratando de encontrar el video pero no e podido encontrarlo. Gracias. Oh wow…thank you for being a fan for such a long time Yvonne! Also you can now watch my show on Amazon…so you don’t have to wait until you are in New York :). Patti I just love your TV series. Gonna try the Ceviche with Shrimp(my idea) Can’t wait to try it. I hope you enjoy it Donna! They are part of the cocoa bean. You can find them at grocery and health food stores. I’m so excited to try this! How do I get cacao nibs do I just grate dark chocolate? Gracias por su programa lo disfruto muchísimo!!! You can find cacao nibs at grocery and health food stores. Hi Pati! I enjoy your show very much! I wanted to ask something. You don’t cook the fish in this recipe? I thought that the fish was cooked at least in lemon juice. Thanks! Thank you for watching Diana! The lime and orange juice cook the fish. I like your program and love it, i like your enthusiasm , love to prepare food and i learn todo much watching people like you , thanks for sharing. Muchas gracias por la receta bien rica Pati! I made this the other night thinking that “to die for” was just a cute title. This was the BEST ceviche I think I have ever had! You were not lying! When I made the leche de tigre, I thought it was too much and that I would have to drain it. But after letting it marinate in the refrigerator about 2 hours, the liquid was reduced to the perfect amount. Samantha I’m so glad you agree with the name of the dish! Pati saludos de todo corazon. Adoro tu programa me trae buenos recuredos condo estava en mexico. Muy buenos guisos y meda ideas para compartilas con mis hijos. Gracias por tus recetas y buen humor. Cuidate de Corazon un paisano Potosino!